Halloween is one of the most fun celebrations ever! We get to dress up our kids with creative costumes that are meant to be spooky, but with our adorable kids they turn out cute and funny! If you want to take your kid to a fun Halloween celebration, then Discovery Suites Ortigas and Discovery Country Suites will be the places to be! On October 30, 2015, head on to Discovery Suites Ortigas for a fun costume party from 3PM until 6PM! This year kids will enjoy a delicious snack buffet and a thrilling tour in their scary booths! Ticket are priced at Php 800 nett per person (for children and adults). If you want to have a relaxing evening and stay the night, room packages are also available from October 29 to 31, 2015. The rates start at Php 5,600 nett in a Junior Suite and Php 6,300 nett in a Junior Serendipity Suite. 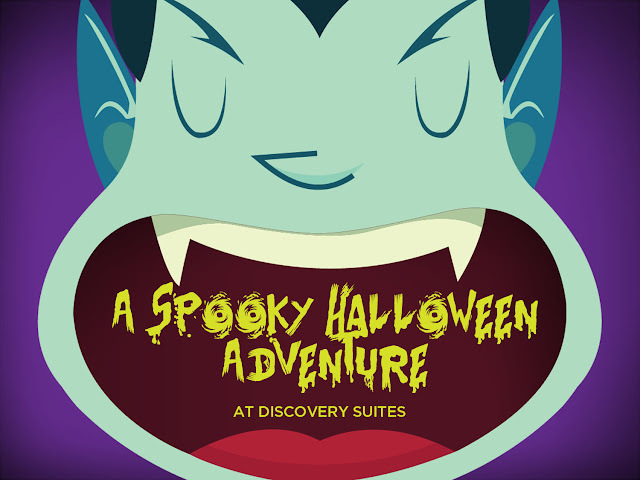 This includes breakfast buffet at Restaurant 5 plus tickets to the Spooky Halloween Adventure event for two! 25 ADB Avenue Ortigas Center, Pasig City. For inquiries and reservations, call (02) 719-8888, email rsvn@discovery.com.ph or visit http://www.discoverysuites.com. Follow Discovery Suites on Facebook for more updates and details! On October 31, from 3PM to 6PM, if you're in hazy Tagaytay area, you may participate in Discovery Country Suites exciting event! They will of course also be having delicious afternoon refreshments, a heart-stopping horror movie screening and a thrilling adventure in a makeshift labyrinth which sounds really exciting! Tickets prices are Php 450 nett for in-house guests and Php 550 nett for walk-in guests. Just beautiful! Room Packages are available from October 29 to 31, 2015, with rates starting at Php 9,000++ in a Deluxe Suite and Php 10,000 ++ in a Premier Suite. This includes country breakfast at Restaurant Verbena and tickets to the Halloween event for two. 300 Calamba Road, San Jose, Tagaytay City, 4120 Philippines. For inquiries and reservations, call (02) 5298172, email dcsrsvn@discovery.com.ph or visit http://www.discoverycountrysuites.com. And follow them on Facebook for more details! It sounds so fun! Thank you for sharing!